Door pieter op 28 maart 2009 om 15:54, in de categorie Engeland. LONDEN – Een groot aantal bekende gebouwen in het Verenigd Koninkrijk zullen worden verduisterd als blijk van deelname aan de wereldwijde aktie ‘Earth Hour’ waarbij aandacht wordt gevraagd voor de verandering in het klimaat. Onder andere The London Eye, The Gerkin, The BBC Tower en The Houses of Parliament zullen in het donker worden gezet. In totaal doen tachtig landen mee aan de aktie en het totaal aantal steden dat mee zal doen wordt geschat op 2800. 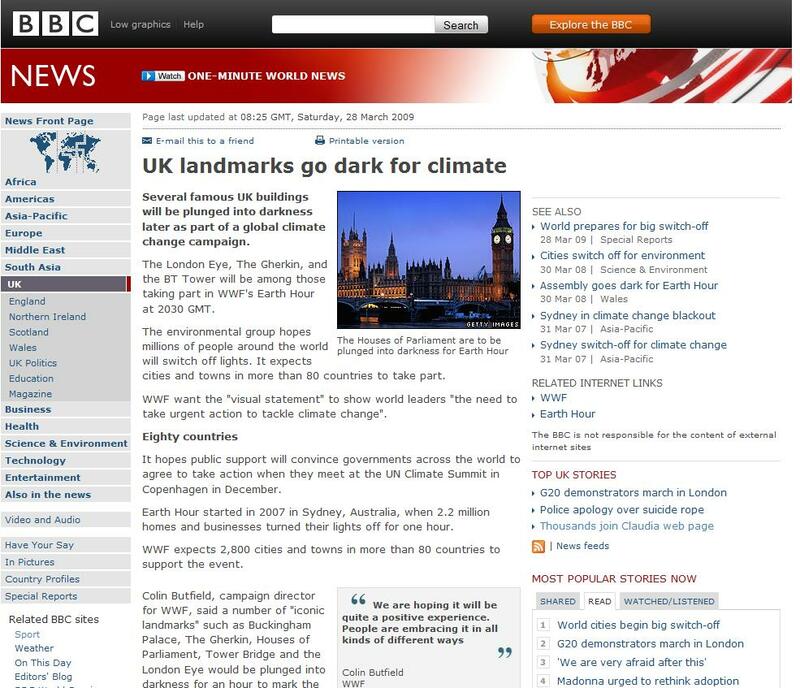 In 2007 werd voor de eerste keer een zogenaamde ‘Earth Hour’ gehouden in Sydney. Dear people, I don’t understand what is all the fuss about this earth hour, for me it’s of no use. Don’t get me wrong I like the fact that people collaborate together for sustainability. But turning of the lights for one hour doesn’t help at all. It only saves money and not the environment. Now people use batteries and candles instead and those are not much better. It’s more effective if we would work that one hour and spend the money we made on a sustainable power production product and install it permanently. This can be a small solar panel or a wind generator, and this device will then produce electricity all the year and for many years to come. So if we collaborate together and create some large solar fields, we can! one day be without the need for a coal or nuclear power plant. Not even thinking about the new economy that we create. So for next time make it the “buying a sustainable power product day.” So that we can live via the (3p)² principal. = People Planet Profit Polluter Pays Principle: The principle that the polluter pays the costs of clearing the problems that are associated with the pollution that has been created for the next generation of people on this planet.